The function f(x)=1000*(1/2)^(x/6000) is the formula to find the half life of a sample of carbon on planet frisbee. The initial sample has 1000 atoms with 10% of decaying carbon 14 molecules. On planet Frisbee molecules of carbon 14 has a half life of 6000 years. In this equation, the total amount of carbon in the atmosphere is labeled on the y-axis and time is labeled on the x-axis. 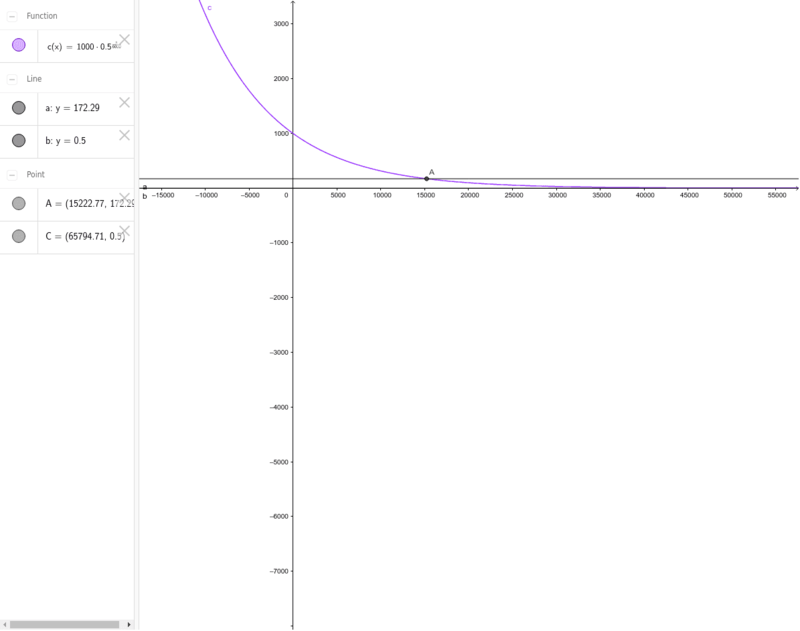 In order to discover how much time has past since the initial amount, set the equation equal to the new sample size. The amount of samples you have and the carbon dating left, is found by the intersection of the c(x) function and line a, which gives you point A (time, sample).